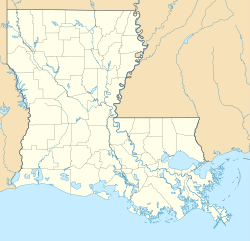 Vidalia is the largest city and the parish seat of Concordia Parish, Louisiana, United States. The population was 4,299 as of the 2010 census. Location of Vidalia in Concordia Parish, Louisiana. Comfort Suites in Vidalia is located near the Convention Center along the Mississippi River. Vidalia is located on the west bank of the Mississippi River at 31°34′6″N 91°26′3″W﻿ / ﻿31.56833°N 91.43417°W﻿ / 31.56833; -91.43417 (31.568295, -91.434268) and has an elevation of 66 feet (20.1 m). The city of Natchez, Mississippi, lies on the opposite bank of the river, connected by the Natchez–Vidalia Bridge, carrying U.S. Routes 65, 84, and 425. Vidalia was founded by Jose Vazquez, when the territory was under Spanish rule, before the United States acquired it in the Louisiana Purchase of 1803. The Great Sandbar Duel, featuring Jim Bowie, is one of the stories still told by local residents. On July 14, 1863, shortly after the fall of Vicksburg and Port Hudson to Union forces, Confederate-controlled Vidalia was entered by 200 mounted infantrymen led by Major Asa Worden of the 14th Wisconsin Volunteer Infantry Regiment. This detachment captured the rear of Confederate General Edmund Kirby Smith's ordnance train on the Trinity Road, 15 miles (24 km) from the river. The Union forces took a large supply of muskets, cartridges, and ammunition. The longest-serving sheriff of Concordia Parish was Eugene P. Campbell, who held the position from 1908 until his death in February 1940. Another long-serving sheriff was Noah W. Cross of Ferriday, who was in office from 1944 to 1948, and 1952 to 1973. Fred L. Schiele, a Vidalia native, was appointed and then elected sheriff from Cross' resignation until 1980. In 1976, the former West and Company Department Store in Vidalia, owned by the late H. O. West of Minden, gained national attention when six female employees filed a civil rights suit claiming gender discrimination for the store's failure to promote women. They said they had been passed over for managerial promotions, although none had filed written applications for such positions. In its 1986 ruling, the United States Court of Appeals for the Fifth Circuit in New Orleans ruled that the lack of written applications is no defense for companies in such matters, because the women had made verbal requests or may have feared retaliation for filing written records. Vidalia is home to Louisiana's first hydroelectric power plant and the largest prefabricated power plant in the world. A total of 41 countries and 21 states collaborated in this historic endeavor, the Sidney A. Murray, Jr. Hydroelectric Station, located in the southern portion of Concordia Parish. The power plant began operation in 1990. The office is located on Texas Street in town. Hyram Copeland, a Democrat, had served as mayor of Vidalia from 1992 to 2016. He is a 2013 inductee of the Louisiana Political Museum and Hall of Fame. Vidalia City Hall is located at 200 Vernon Stevens Boulevard. Historic photographs are on display for viewing between 8:30 a.m. and 4:30 p.m., Monday through Friday. Some of the historic photographs feature the moving of the town from the original site in 1938-1939. The Tacony Plantation in Vidalia is listed on the National Register of Historic Places. One of the community's favorite features is Vidalia Landing Riverfront Park, which has landscaped green space, a hotel, convention and conference center; amphitheater; and health facilities: ambulatory care center and acute care facility; a walking/biking trail, and public boat ramps. The park provides a way for residents to reconnect with the river, which was so important to its past as a riverport. Vidalia leaders joined to partner in the creation of Municipal Park. With the City's purchase of 70+ acres, Concordia Recreation District #3 constructed a Sports Complex. Municipal Park is also home to the newly constructed City Hall, Police Station, and Fire Department. In addition to municipal services and sports, the park accommodates the Dr. William T. Polk City Park and the Vidalia Community Garden. Through a grant from the TDF Foundation, both Vidalia Landing Riverfront Park and Municipal Park, have free WiFi service. Concordia Parish is the northern gateway to the Atchafalaya Trace Heritage Area, a culturally rich natural wonder encompassing 13 parishes in and around the Atchafalaya Basin. The lives and traditions of the people of this region are emphasized. The state of Louisiana and representatives from each of the thirteen member parishes are working to support projects that recognize this special heritage. A scenic byway will be part of the Atchafalaya Trace Heritage Area. The Delta Museum, which is now housed in the former post office building in downtown Ferriday, honors Mickey Gilley, Jerry Lee Lewis, journalist Howard K. Smith, evangelist Jimmy Swaggart, journalist Howard K. Smith, Hollywood socialite Ann Boyar Warner, and jazz musician Leon "Pee Wee" Whittaker. The museum, featuring six life-sized exhibits, is open Monday through Friday from 9 a.m. to noon and 1 p.m. to 4 p.m. and Saturday from 9 a.m. to noon. The Frogmore Plantation west of Vidalia is a 1,800-acre (730 ha) working historic cotton plantation. It has cotton gins, an historic slave row, and eighteen dependencies. The plantation received a Rural Tourism Award in 1999. As of the census of 2010, there were 4,299 people, 1,707 households, and 1,186 families residing in the town. The population density was 1,959.7 people per square mile (756.1/km²). There were 1,910 housing units at an average density of 823.9 per square mile (317.9/km²). The racial makeup of the town was 72.0% White, 26.2% African American, 0.2% Native American, 0.4% Asian, 0.4% from other races, and 0.7% from two or more races. Hispanic or Latino of any race were 1.5% of the population. There were 1,779 households out of which 33.4% had children under the age of 18 living with them, 51.5% were married couples living together, 16.5% had a female householder with no husband present, and 27.5% were non-families. 25.4% of all households were made up of individuals and 11.7% had someone living alone who was 65 years of age or older. The average household size was 2.55 and the average family size was 3.07. In the town, the population was spread out with 27.4% under the age of 18, 8.1% from 18 to 24, 26.4% from 25 to 44, 23.0% from 45 to 64, and 15.1% who were 65 years of age or older. The median age was 38 years. For every 100 females, there were 91.2 males. For every 100 females age 18 and over, there were 86.4 males. The median income for a household in the town was $29,500, and the median income for a family was $36,917. Males had a median income of $31,667 versus $21,455 for females. The per capita income for the town was $14,478. About 17.8% of families and 19.1% of the population were below the poverty line, including 25.2% of those under age 18 and 13.5% of those age 65 or over. ^ a b "Geographic Identifiers: 2010 Demographic Profile Data (G001): Vidalia town, Louisiana". U.S. Census Bureau, American Factfinder. Retrieved August 20, 2014. ^ "United States Court of Appeals, Fifth Circuit, New Orleans, October 23, 1986". openjurist.org. Retrieved June 1, 2010. ^ "Mayor Hyram Copeland". concordiaed.com. Retrieved October 19, 2013. ^ "Tacony Plantation House". National Park Service. Retrieved July 18, 2016.